“The 2016 ATHENA finalists do more than push the boundaries of achievement, they shatter them,” said CEO Todd Sanders. 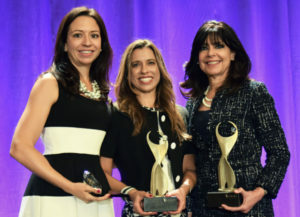 The Greater Phoenix Chamber of Commerce announced the 2016 ATHENA Public Sector, Private Sector and Young Professional Award recipients during its 29th Annual ATHENA Awards Luncheon Oct. 26 at the Westin Kierland Resort & Spa. Rebecca Clyde, co-founder & CXO of Ideas Collide, was awarded the 2016 ATHENA Businesswoman of the Year Award in the private sector. Maria Harper-Marinick, Ph.D., chancellor of Maricopa Community College District, earned the 2016 ATHENA Businesswoman of the Year Award in the public sector. Catherine Alonzo, founding partner of Javelina, took home the 2016 ATHENA Young Professional Award. The event marks the 29th year the Greater Phoenix Chamber has honored Valley businesswomen. The ATHENA Awards, named after the Greek goddess of courage and wisdom, is a program of ATHENA International, a foundation dedicated to creating leadership opportunities for women. “I’m overwhelmed with gratitude…this is a huge honor,” said Rebecca Clyde, 2016 ATHENA Businesswoman of the Year Award recipient in the private sector. “I’ve met so many outstanding women through the ATHENA process, it’s been an incredible journey. I embrace the concept of inclusive leadership in which we collectively achieve so much more with representation from diverse groups. Together, we can do more. Growing up in a large family and having to fight to be heard, Clyde learned at a young age what it means to work hard. Today she is driven by the desire to be part of something big that gives back to the community. Inspired by a breast cancer survivor in her family, Clyde is very involved with Susan G. Komen of Arizona. Clyde strives to create a better world for her two young daughters and son to inherit. Risk-taking, problem-solving and openness to change are all qualities exemplified by Harper-Marinick. She oversees 10 colleges and has 20 years of experience in the Maricopa Community College District system, has dreamed of being in education since age five. As a mentor, she teaches self-awareness and personal reflection as keys to success and empowerment. Traveling to Arizona from the United Kingdom in pursuit of a master’s degree was only supposed to be temporary for Alonzo, but after volunteering on a political campaign and meeting her soon-to-be business partner and mentor, she never looked back. Helping others reach their goals and see themselves as leaders is a priority to Alonzo which is why she takes mentoring so seriously. She is inspired by people who fight for change and is a strong advocate for the LGBT community and equality. The Greater Phoenix Chamber of Commerce recognized former Gov. Jane Dee Hull as its 2016 Community Legacy Honoree. From being the first female speaker of the Arizona House of Representatives to being the first woman elected governor of the Grand Canyon State, trailblazer Jane Dee Hull truly embodies the leadership and dedication recognized by the Community Legacy Honor. The Community Legacy Honor recognizes an outstanding female former elected or public official who has dedicated her work and her life to improving the community, supporting women and being an exemplary role model for female leadership. Her work and efforts have left a lasting legacy on her community.